CHENNAI: It certainly isn’t a common sight to spot a lending library on the busy stretch of Usman Road, T Nagar, synonymous for pavement bargains, jewellery and footwear. So, when I located&nbsp; the Raviraj Lending Library, quite by chance, I retraced my steps to get a closer look. Not for the books, but simply to figure out how a lending library made it’s way into this street shopper’s paradise. But first, I had to test my theory by making sure that there were no other libraries or book stores nearby. As expected, I didn’t find a single one, on the entire stretch — from Pothys to the T Nagar Bus Terminus. When I walked back to the library, I heard the owner, Raviraj, shouting “Books for sale!”. I’ve been to other lending libraries in the city like Eashwari and Minnie, but I had never actually met Eashwari or Minnie. So it was quite a thrill to meet Raviraj! The library is not very spacious — just over 100sqft, and the racks are roughly 12ft high with not more than 10 blocks that make a perimeter of the rectangular premises. You get the feeling that you’re entering a cave, as it gets darker and smells frosty as you go in. While at the entrance it’s all new books, both Tamil and English with glossy paperbacks, the older ones, bound between hardcovers and covered additionally by a layer of dust, adorn the interior shelves. From Kadal Pura by Sandilyan to Gone With the Wind by Margaret Mitchell, the library seems to be home to many a classic novel. Just like in the old days, there is a ladder strewn on a shelf for customers to climb up and seek books ‘uphill’ at their leisure. As I was looking at different authors’ names on the frames of the shelves, Raviraj turned a little sceptical and started asking me what book I was looking for. Thankfully, some prospective customers interrupted, asking for specific authors and thus saved me from any further interrogation. Raviraj, I overheard, sells the books and chooses not to lend anymore. However, he makes a good impression by assuring these new customers that they can return the book anytime and get half the money back. But he still keeps the practice of lending magazines and has quite a few regulars in this regard. The owner of this store seems to have his own version of the alphabet —&nbsp;&nbsp; it’s ‘A’ for Arthur Clarke and ‘J’ for Jeffery Archer. However, I did have more questions and considering my near empty wallet, chose to finally confess that I was with the press, and it helped. 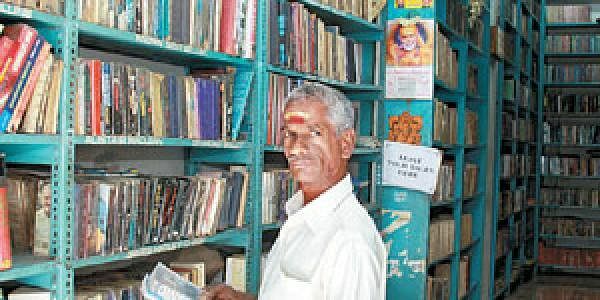 The library is 48 years old and Raviraj, along with his brother has been running it till date. “Many famous doctors and other professionals were members of this library and frequented here to take books home,” he says. The building, where this library is housed, seems to be one of the oldest buildings on Usman Road. Raviraj pays just `750 as rent every month even now, but is being pressured into paying `35,000 as per the new fair rent practice. While the case has been pending in the court, Raviraj is hoping to get a fair justice. During the conversation, he mentioned that girls read more these days and that (whether it meant to or not) immediately prompted me to buy a book for `130.